Our trip to Longleat this March was different this year as my daughter had won our weekend short-break as a Center Parcs family blogger. As a party we had two lodges and we had the adapted lodge because we had our eldest granddaughter with us who is severely disabled, also it was the first time we have not been in executive accommodation. The lodge is very nice, warm and lots of space for a wheelchair also had a beautiful view and the position was very close to the plaza.We did really miss having Wifi as you do get that in the executive lodges but as it was just a weekend we managed. The adapted bedroom was a really good size and had an electric bed in it, but the first thing I noticed was it was too cold, the radiator was far too small for a room that size and we needed to use a fan heater as back up. There are no hoists in the lodges, so they are more suitable for people with limited mobility rather than those with no mobility at all. We have been told they can give you a phone number to hire a hoist in, we have our own mobile hoist but it is just such a lot to have to bring with you. 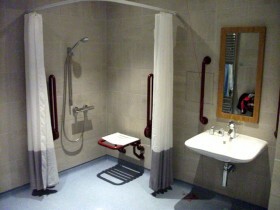 The wet room is across the dining area from the bedroom, again it is a good size and it was lovely and warm, perfect for those with some mobility, but we needed a shower chair which they do not have so we would have had to bring one with us. The lodge was fine for the weekend and the fact we had our own hoist, and wonderful for those who are not totally wheelchair bound. In general Center Parcs is very good at having disabled access, we thought the changing room very good with a hoist and bed, staff very helpful, but we had hired a cabana and luckily our granddaughter is not very heavy as she had to be carried down into the cabana and sat on a lounger, which for some would be impossible, so make sure you check this out when booking things like that. Longleat is very pretty and we did have a great time but I would recommend Sherwood as the better flatter park for those who have to take wheelchairs with them. I would like to say I think Center Parcs really does a great job of trying to give everyone a good holiday. Just read your review on Longleats Center Parcs. We normally holiday at Elvedon Center Parcs but fancy a change next year and are considering Longleat. We have been to Longleat years ago so are aware of the layout. But this was before children. Our middle daughter will be 12 soon and like your grandaughter is severely disabled.
. Can you confirm that the swimming pool disabled changing area has hoists?? And also did you make use of the wheelchair accesible transport service provided by CP?? If so would you recommend it. Very nice to hear from you, we are going back to Longleat in November. I can confirm they have one very good changing room that is for the more disabled people and has a hoist, you will need your own sling. I would suggest as you get in their ask for a member of staff to show you through they are very good and very helpfull. As for the transport we have used it and it has a lift ramp but the downside of that is it has got to be booked and you can have a 20 minute wait which was no good for my granddaughter. What you need to do is ring longleat and asked to speak to the nurses onsite and they can issue a special orange badge a bit like the blue badge that lets you drive around the site to get your daughter where you want to be. They do ask you if she has an adapted vehicle and it sounds as though you have and just ell it like it is, she cannot be sat around waiting for booked transport, they will give you the badge you need, all in all they are very good. I did not see any hoists into the pools though but maybe as she is still twelve she can be carried in that is what we used to do, not perfect but our granddaughter had lots of fun. I hope you have a wonderful time and your daughter gets to have some fun, and thank you for getting in touch. I shall be updating my site very soon as my granddaughter is in transition into adulthood and thats a whole new story.